Slipping on a pair of dark glasses, Agent Kay raises a mysterious handheld device before a crowd of shocked New Yorkers. Suddenly, the unit emits a brilliant flash of light that vaporizes all memory of a violent attack by space aliens from the minds of panicked earthlings who had just witnessed the horror. That little flashy thing, as Will Smith's character calls it in this scene from the movie Men in Black, is not entirely science fiction; neuroscientists know how to erase memories of the recent past, while leaving well-established memories intact. 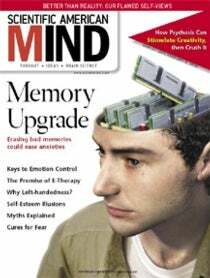 And new research suggests that even long-term memories could be deleted.